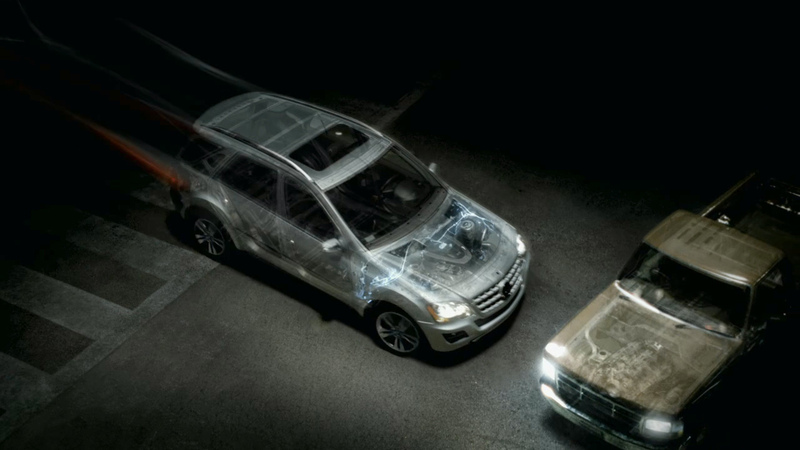 Crashing a brand new redesigned Mercedes M-Class was out of the question, so The Mill NY invented a uniquely illuminating way to show where its innovative safety features activate beneath the car’s sleek exterior in anticipation of an impact. ‘Crossroads’ is the spectacular 30-second spot made to publicize the M-Class safety innovations, which include impact sensors, dual-stage airbags, advanced crumple zone and cabin design to absorb and deflect energy and protect its passengers. Not for the first time, the sophisticated European style and innovative use of special effects by MJZ director Victor Garcia has benefited a Mercedes commercial. In 'Crossroads', in advance of a collision, a virtual version of the Mercedes moves ahead of itself and crashes into another car which was entirely CG-built. As the slow motion sequence ends, the two damaged vehicles dissolve and disappear. The Mill did a test run to show how the 3D team could create an x-ray view of the car's safety features in action during a collision. VFX supervisor, Andrew Proctor was on set and led the CGI team. After the shoot, they rendered all the interior elements from CAD data supplied by the car manufacturer. As Andrew says, "Typically on a CG car spot we only work with the exterior, but for this one we had to see everything inside. We had to animate and render everything - the engine, gears, suspension, etc. - then set the look and blend the live-action car with the CG internal elements." To add to the drama the team also generated smashing glass, electrical pulses and simulated airbags. The car was deformed to match the crash damage and people reconstructed from on-set photographs.